On Friday, June 22nd 2018, Greet Castermans and Sarah Gerard, Representatives of the Colruyt Group visited UDINUS and tried Gamelan. The purpose of their visitation was to give scholarship to 30 students from various majors in UDINUS. The cooperation between Colruyt Group, Yayasan Kesejahteraan Anak Indonesia (YKAI) and UDINUS has been running for more than 15 years. The scholarship is not only for Indonesia, but also for other countries in the world, two of them are for Africa and Belgium. During the visitation, both Greet Castermans and Sarah Gerard were interested to try Gamelan. They were guided by UDINUS’ lecturers who will perform at UNESCO and Paris, France in the next few days. She said E-Gamelan was a very unique innovation and a breakthrough that should be tried and learned by young generation. According to her, the scholarship for young generation in Indonesia was a form of gratitude from our company for Indonesia and its arts. "I will introduce E-Gamelan to my child in Belgium. This application is worth to try. 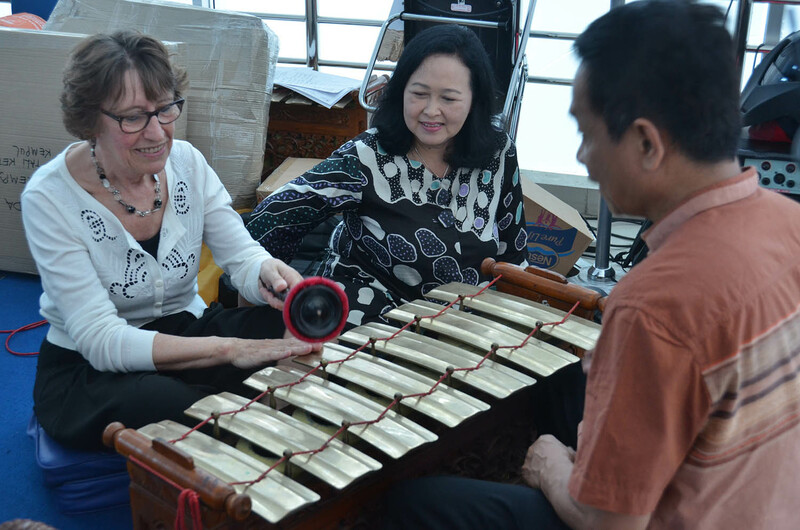 We will also introduce E-Gamelan to young generation in Belgium, "She added when she was interviewed after playing Gamelan on the 1st floor of H building, UDINUS. UDINUS’ Rector, Prof.Dr. Edi Noersasongko, M.Kom said that he was very happy with the visitation and the scholarship from Colruyt Group. He said UDINUS’ E-Gamelan would also perform in Belgium. "The representatives from the Colruyt Group will watch our performance at UNESCO, and we will discuss the performance in Belgium there," he said.